The 4th Infantry Division has always been there in America's modern wars. On 14 September 1918 the men of the "Ivy” Division stood up in their trenches and prepared to attack. It would be one of the first times that American troops would operate autonomously, aside from Anglo-Franco command. They would go over the top on uneven ground to be blown to pieces by German artillery and fall in their hundreds to the spitting of German machine guns, yet nevertheless win the day. In World War II on D-Day they scrambled ashore across the sands of Utah beach and remained fighting in Europe until Hitler was dead and Germany had surrendered. From the Normandy campaign to the hell of the Hürtgen Forest and the Battle of the Bulge, no other American division suffered more casualties in the European theater than the 4th, and no other division accomplished as much. In Vietnam they would execute precarious 'search and destroy' missions in dense jungles against a determined and resourceful enemy. They experienced a series of major engagements that would entail 33 consecutive days of vicious, close-quarter combat in the battle of Dak To in 1967. For their actions in Indochina they would receive no fewer than 11 Medals of Honor. They fought in Iraq to topple Saddam Hussein, and in May 2009, at the height of Operation Enduring Freedom, the 4th Infantry Brigade Combat Team deployed to Afghanistan for a 12-month combat mission. They operated in the birthplace of the Taliban along the Arghandab River Valley, west of Kandahar City, a place often ominously referred to as "The Heart of Darkness." The 2nd Battalion 12th Infantry Regiment saw heavy combat throughout. Through firsthand interviews with veterans, across the decades, and the expert analysis of the authors, the role of one of America's mainstay divisions in its modern conflicts is in these pages illuminated. 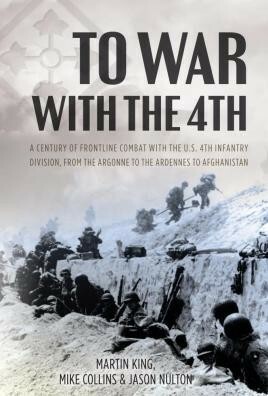 The book authors liberally season their narrative with first hand accounts by individual soldiers, including some from the enemy's side, which help illustrate how the experience of military service and combat has changed, and in some cases not changed, over the century… To War with the 4th will be of value for those with an interest in the experience of combat. ...interspersed with many first-hand accounts which vividly bring to life the realities of warfare.